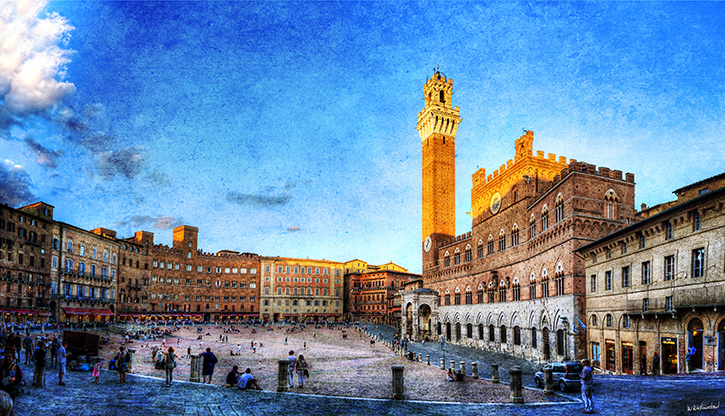 The Piazza del Campo at dusk. It is not just the shape and the concentric slope that are peculiar in this wonderful square. People actually act different. Ever seen people sun-bathing in public squares? On my last post I wrote about the days I spent in Florence. I will probably return there in some other post, but first I will tell you about other places I visited, like Siena, and the way, sometimes, unexpected happenings affect us in unexpected ways. This is the little story of my visit to Siena and of an amazingly skillful violinist who cheated me but, in exchange, presented me with one of the most beautiful melodies I have ever heard. Fragment of “Sunset in Florence” from Piazzale Michelangelo. 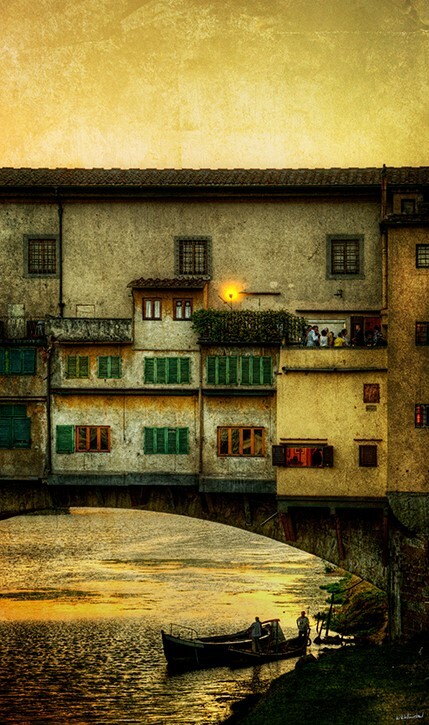 The Ponte Vecchio and the Palazzo Vecchio – vintage version (click to see full panorama). The Ponte Vecchio at sunset. Some men tethered their boats at the end of the day, while some people worked and others partied, above them. 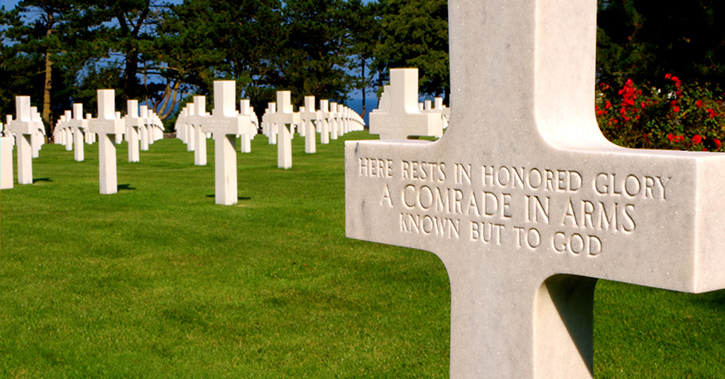 As some of you might know, I spent nine days in Normandy last year. It was an epiphany of sorts. I had never traveled alone before and I didn’t know at the time if I would enjoy it or not. When I prepared that journey I was so thrilled I was going to Normandy. When I came back I was so thrilled I had gone alone. These were nine intense, tiresome and amazing days that I will never forget, and I decided I would set out on my own at least once yearly from then on. American Cemetery at Omaha Beach. A place best visited alone (click to visit gallery). My idea this year was to spend around 10 days visiting the WWI trenches , the areas of the Somme, Amiens, Verdun, Ypres. 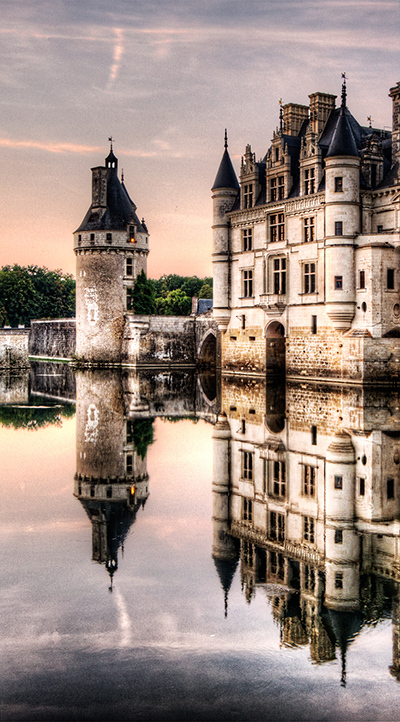 Maybe I’d travel a little forward in time from there to the WWII Ardennes and then back to Napoleon’s Waterloo. Once there, why not? At the end of August, when I had most of the itinerary planned out and organized, I realized I was not in the mood to visit so many places of death. My mind frame was just not right, so I changed my course radically: I had planned a journey to war in which I would have driven for hours every day around a wide area covering three countries. Instead, I traveled to the cradle of European rebirth, the heart of the Renaissance, to Florence. The idea was to discard the vehicle and stay put, just wandering around surrounded by beauty and, through it, forgetting about myself. I was eleven days away from home. It took me four to drive there and two more to return home. The other five days I spent in Florence. An unforgettable stay. Panoramic view of Florence in the evening from Piazzale Michelangelo. Something like this, but from further away, was my first glimpse of the Duomo when I was driving in. A moving moment (click to enlarge). 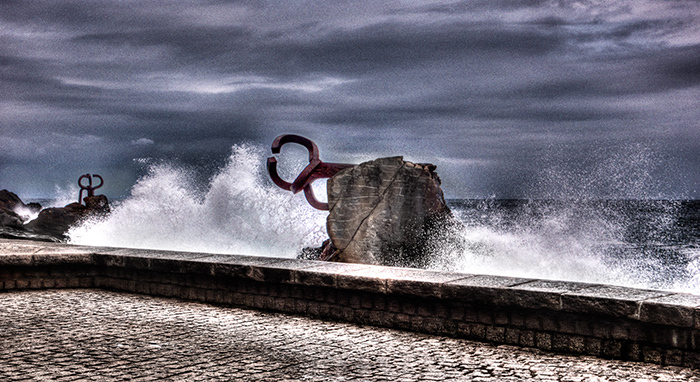 Chillida’s Comb of the Winds, San Sebastian. Wonderful from the professional point of view but, while everything went so fine for me, life was just hammering people all around. Among other things, I am a personal Maths teacher. I started last year, and getting the first students is pretty hard. Last week I got a new kid because his teacher at the time had fallen seriously ill. This week I got a second one because she died. She was just 31, had studied architecture and life didn’t give her time to find a job on what she had fought so hard to be. Today two kids in their twenties killed themselves against a truck on the turnpike, not 1 minute away from my house. I hate that bend. That part of the turnpike was opened not three years ago and it was just bidding its time, waiting for prey. Today it scored two students. Also today, my little engineering company issued the first two bills in 20 months. First money it makes. On top of all this, my wife learned yesterday one friend of hers has lung cancer. So, all in all, bitter-sweet week, in which I am feeling great but not quite. How could I? Life is a gift, but it can be nonetheless ruthless. There is a Pearl Jam song titled Sirens that says “it’s a fragile thing this life we lead. If I think too much I can get overwhelmed by the grace by which we live our lives with death over our shoulders”. I think these words explain in a wonderful way what many people do, celebrate life while they are aware, or maybe because they are aware, it is finite, that it can end anytime. It is in days like these, when you are not directly hit but you can see where the bombs are falling, when this feeling surfaces with most intensity. I tell myself, live, man, LIVE! for we never know. For me, LIVING means making the most of each and every day, it means giving love to those around me. It means planing for a long life, but enjoying the present. We won’t be happy next month or year if we don’t learn to live today. LIVE. Try to get rich, but not in money, but in experiences and affection. To help and be helped, to love and be loved, to share… these things cannot be bought, and are the only ones that give life a real meaning. But I am repeating myself. Many others, however, do not live their lives with grace, but with recklessness, with disrespect, as if they had many lives to live, infinite days to waste. So they allow banal things to spoil their days one after another. We need to LIVE. We need to learn to respect our own lives, to be grateful for all the things we have, and do not have. Things we and take for granted and which are not taken into account until lost. Life can be ruthless, but it is the most precious gift. It is worth to fight for, to be fully savored, to the last second. In times like these I remember Katixa. A girl, a woman, I never knew. And I honor her. The following is the translation of something I posted on a forum 19 months ago. 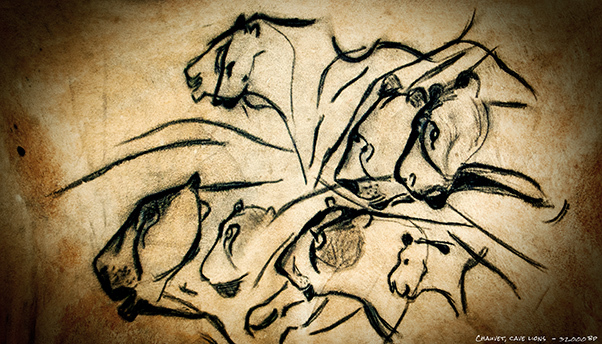 Chauvet Cave Lions. Handmade wax crayon painting on leather. Two of my hobbies inter-twinned, drawing and paleoanthropology (click to enlarge). They say a rolling stone gathers no moss. I think of myself as a slow rolling one. I get some moss, not too much, then I move on and start gathering a different sort of moss. My moss cover is a nice patchwork blanket in different tones of green. I often say I am a willingly unimpressive multi-hobbyist. There are many pastimes and disciplines I love, but I have always favored quantity before quality. I am too curious to try being really good at just one thing. It needs focus and sacrifice. I do not mean sacrifice as effort, but the sacrifice of other activities. I do not want to. Seems we all need to be particularly good at something so we can be respected and defined by it. I do not agree, there are way to many wonderful things to do in this world, to sacrifice them for just one. Of course, that’s only my point of view. You could think exactly the opposite and be totally right. Thus, I have always tried to be good at what I do for a living because I am paid for it, but in my leisure time I only go as far as I can without the need to focus too long. I play the guitar, even played in a band, wrote our songs and sung them too. Terribly, true, but we loved it. I build, paint and age scale model vehicles, I grow orchids, draw with pencil and ink, write, have an outdoors little garden, create little inventions, play some sports, bind books, had a complete chemical dark-room, run slot-cars, I grow tadpoles and Tritons, mounted moths (did not kill them,though)… I am not outstandingly good at any of these activities, but I have the chance to take pleasure of each and every one. That’s why I am a willingly unimpressive multi-hobbyist, a slow rolling stone. I had some twelve hours to drive if I just stopped to rest, so I decided to split the journey in two and enjoy the road-trip. Returning home in no hurry, there was no reason I could not make the best of it. This extra day allowed me to visit four amazing places and bring home 45 pounds of some of the best quality flint-stone in the world. However, I will just talk about the place I picked to spend the night and the little excursion I made under the moonlight. The Cliffs of Etretat, looking south (click to enlarge). I said I would write three entries about my journey to Normandy. 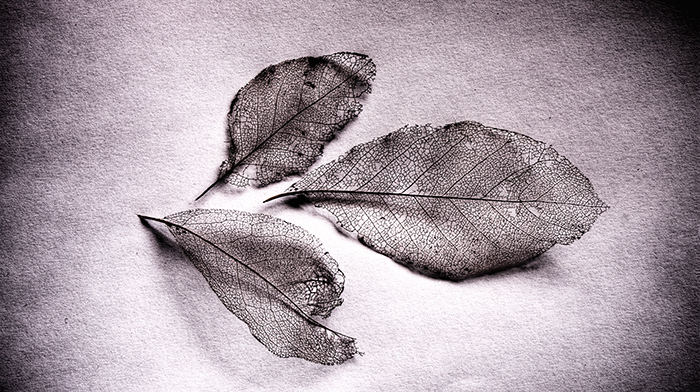 Well, I lied… The first was about what it felt like to travel alone, the second about war. The third was to be about all the cool stuff I saw in those experience-packed nine days. However, this third post was getting too lengthy, so I decided to split it into two parts. Here’s the second, with some more cool stuff. 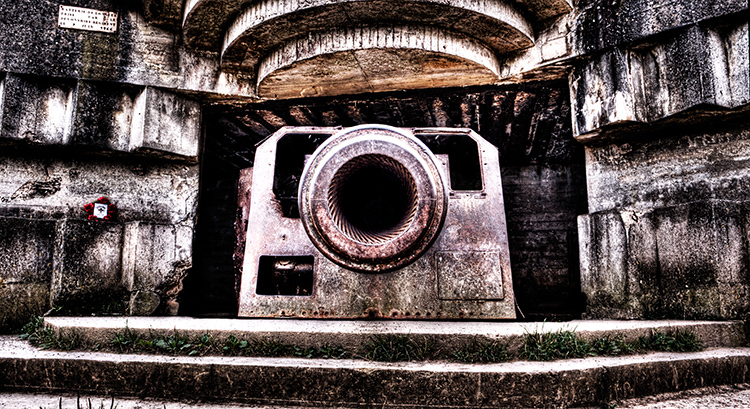 German cannon in Longes sur Mer on the coast of Normandy (click to enlarge). I said I would write three entries about my journey to Normandy. The first was about what it felt like to travel alone, the second about the war. The third, this one, goes about all the cool stuff that I saw in those experience-packed nine days. Cannons, tanks, submarines, airplanes, toilettes, you name it. If you want to see lots of WWII cool stuff, keep on reading. Ever Forward – a Omaha Beach memorial from the surviving veterans and families to those who fell (click image to see complete, click here to see FDR quoted version). There is a reason I went to Normandy in this my first lone travel. War. I wanted to be able to take the time, to immerse myself in history without having to worry about boring anybody by my side. I wanted to pay homage to all those kids that lay down their lives so we could live in a better world. Few wars are as easy to understand and chose sides as WWII. Not many shades of grey. And those kids did die to give us a better world. So I thought I would go there, take my time and pay my respects. Thus, after that first night by Mont Saint Michel, I packed and moved base camp to Bayeux. There are many ways to revisit history. You can be interested about strategy, equipment, numbers, armament, terrain… We live in a world that was for the last time reshaped as a result of two terrible World Wars, being the second a more or less direct consequence of the first. These wars have, no matter how we might ignore them,shaped our daily lives, and are one of the keys to understanding our world as it is. These wars are also part of our culture, of our collective imaginary from early childhood. Most of us have grown up whistling the tune on “The Bridge on the River Kwai” or “The Great Escape”, Darth Vader wears a helmet of unquestionable inspiration (will not use the n word), and the only things a kid can kill on his PlayStation without worrying his parents are zombies and WWII German soldiers. US Paratrooper helmet signed by some of the men that jumped over Normandy on D-Day, just before dawn (click to enlarge).